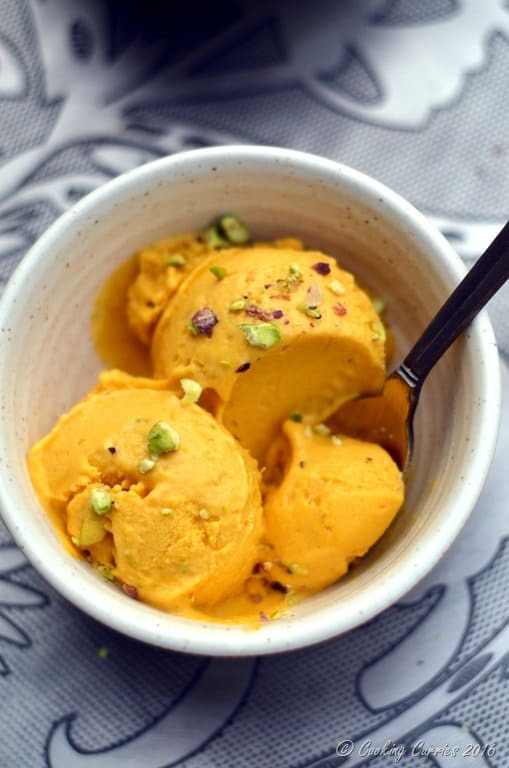 This creamy Vegan Mango Ice Cream has only three ingredients and no added sugar. 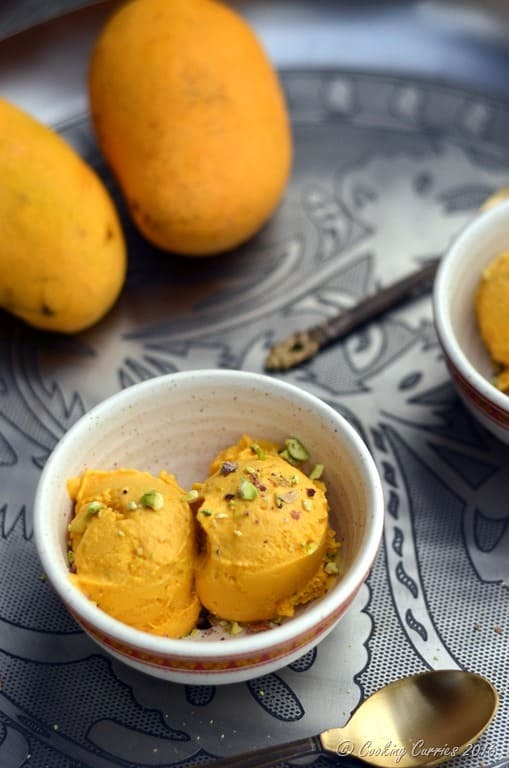 Make sure you use sweet ripe mangoes and you will not miss the sugar in this summer treat! Ripe sweet mangoes, the fragrance of them calls out to you to devour them. 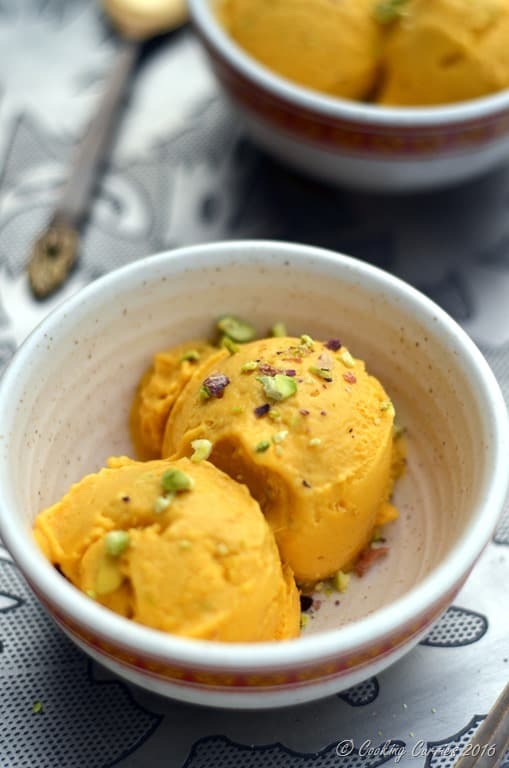 Even though the mangoes here in the US are not so fragrant as the ones in India, where the markets are filled with the sweet scent of mangoes come summer, mangoes are still mangoes and I love them! 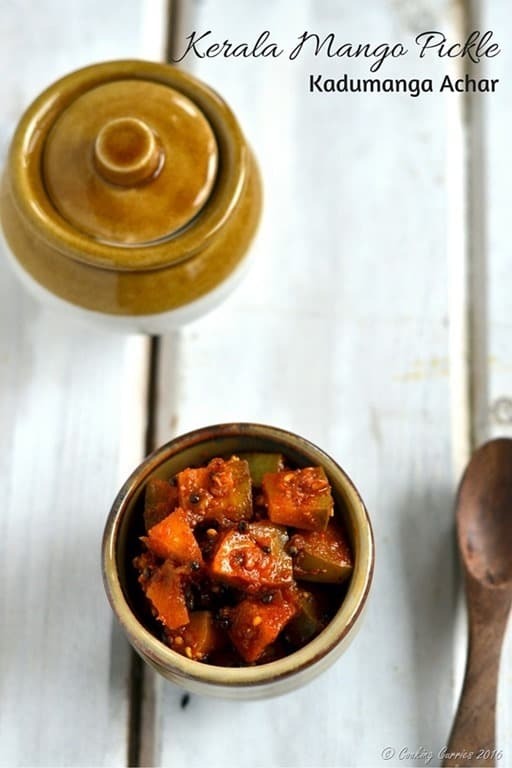 I can never get enough of mangoes, raw or ripe and I always look for new ways to make something with mangoes, though just peeling and eating them is more than enough sometimes. 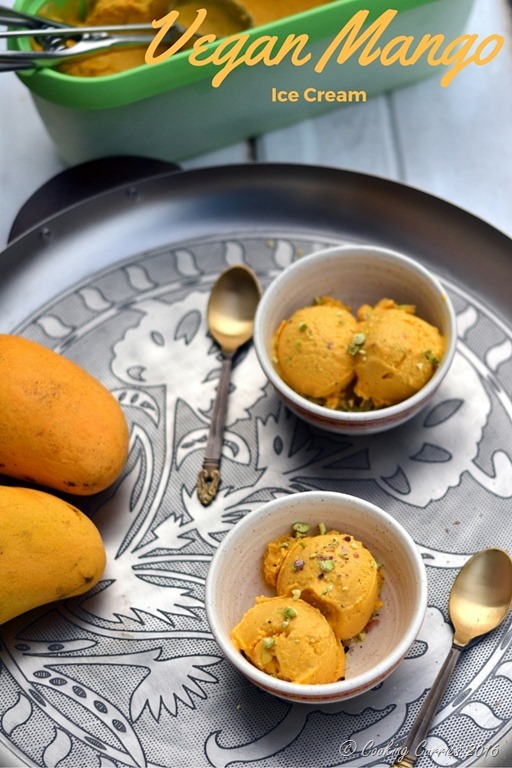 Sweet or savory, hot or cold – the options with mangoes are endless. 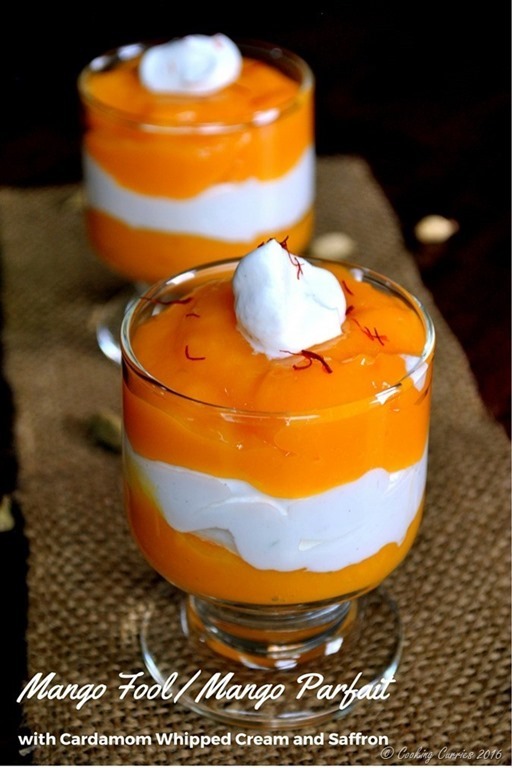 Mangoes and coconut are a made for each other combination. 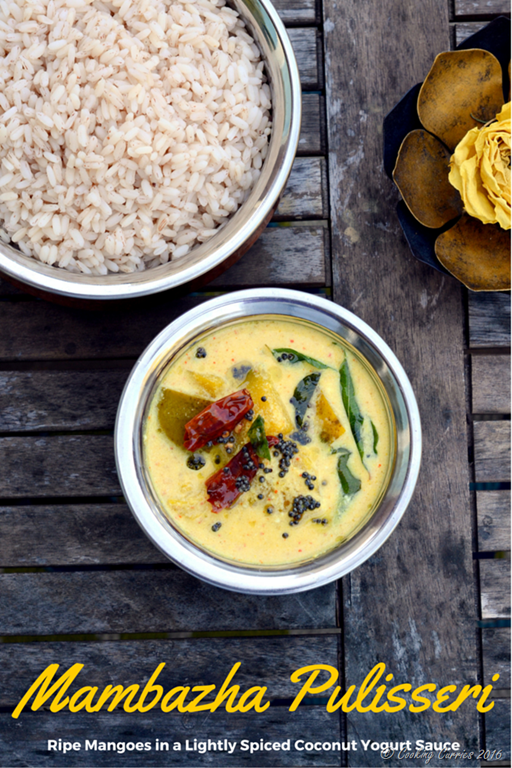 Several traditional Kerala curries made with mangoes always have coconut in them. So, when I was thinking of making a mango ice cream, the thought of adding coconut milk instead of cream to this was only natural to me. The pistachios add a little bit of texture and crunch to the creamy ice cream. Even though the ice cream is creamy, it is in no way cloyingly sweet and too rich. The mangoes I had were nice and sweet and there is a little bit of inherent sweetness to the coconut milk, so there was no need to add any sugar to it. Also, while making it, to use up all the mango in the blender jar, I poured the coconut milk into it and pulsed it a little and I think that gave quite a bit of airiness to the coconut milk and allowed it to make the ice cream a lot more creamier. 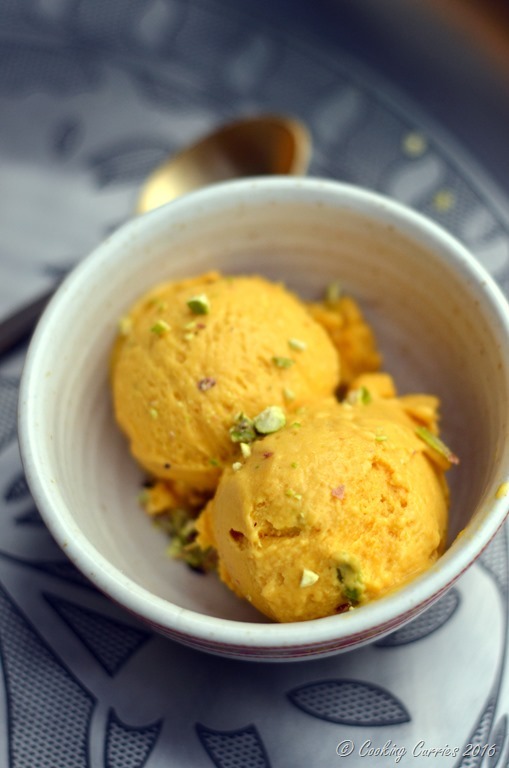 The coconut milk had a creamy texture to it too and I did not see the need to make it a custard base ice cream and lose the essence of the mangoes, so I made them egg-less too. I prefer egg-less ice cream to ones with eggs in it as I am a little iffy when it comes to raw eggs that you eat after a prolonged period of time, especially in ice cream and such. I don’t mind runny fried eggs and poached eggs. 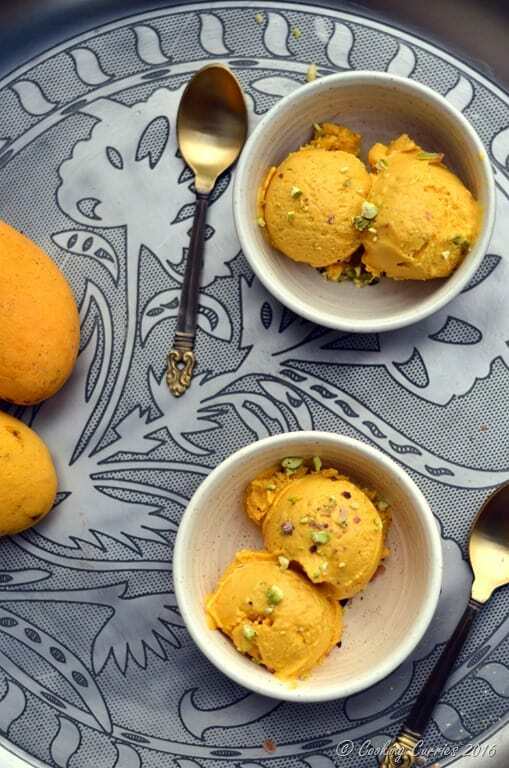 While you enjoy this three ingredient vegan mango ice cream with pistachios, this summer, here are a few more of my favorite recipes with mango. Make sure you check them out and hope to get some time to make these soon! Do let me know in the comments below if you do! I love hearing from you guys! Prep your ice cream maker. Blend the mangoes in a blender until smooth. 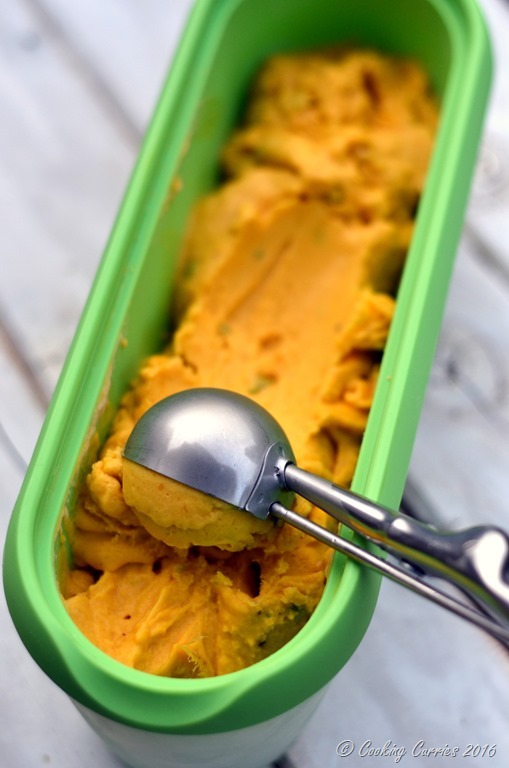 Pour the mango puree into the bowl of your ice cream maker. Pour the coconut milk into the same blender jar and pulse it a few times. Add this to the ice cream maker and turn it on. After about 10 mins when it starts to thicken a little, add the crushed pistachios to it, reserving a few for garnish, if needed. Let the ice cream maker works its magic for about 10 mins more and scoop out the ice cream to a ice cream container and freeze for a couple of hours to just let it solidify. Top with more crushed pistachios before serving. Let the ice cream maker works its magic for about 10 mins more and scoop out the ice cream to an ice cream container and freeze for a couple of hours to just let it solidify. Given that this only spends 10 minutes in the ice cream maker anyway, would it be possible to make this without one? I’m thinking using a food processor to blend the ingredients and then just freezing the ice-cream. 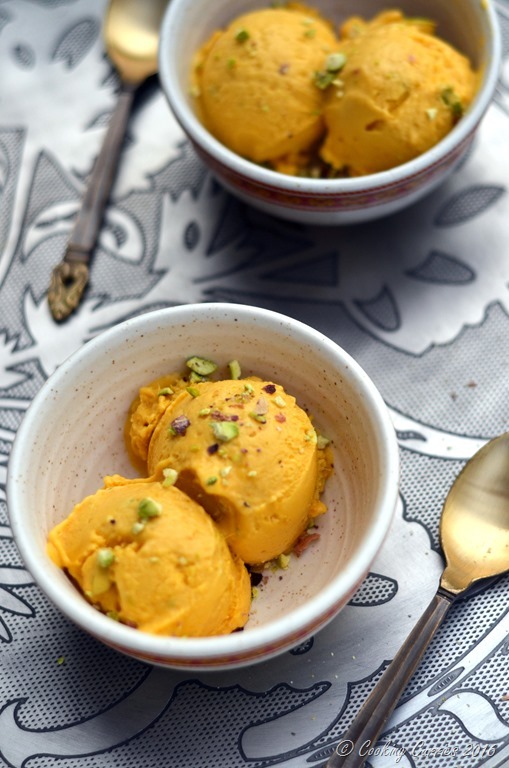 Does the ice-cream maker really make much difference to the finished recipe? You can absolutely do that! I find the texture to be a tad bit better when churned. Also, once churned in the ice cream maker you can eat it right away and don’t necessarily have to wait for it to be in the freezer for a few hours. It will probably melt quicker than when kept in freezer for a while but it will still be ice cream if you eat it right away. That said, if you don’t have an ice cream maker, you can just blend them all together and freeze it, bough I would suggest to pull them out once half frozen, blend again and freeze again! That’s what my mom used to do when we didn’t have an ice cream maker. Do let me know how that works out for you ? Can I use mango juice instead of mangoes? It won’t be as creamy. 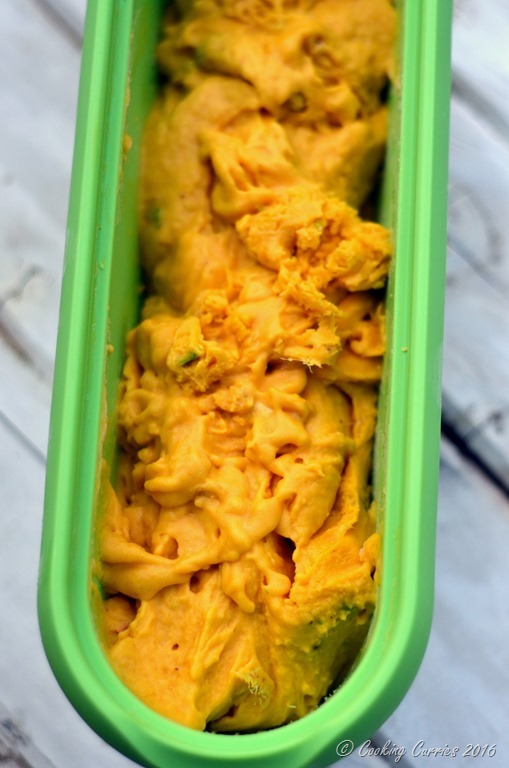 You can use frozen mangoes if you don’t get fresh ones. I was wondering should I whip the coconut milk first( don’t have an ice cream maker) thank you!!! Hello! Thank you for what sounds like a delicious alternative. When you use coconut milk do you only use the solidified cream or the cream and the liquid as well? Both the cream and liquid. I shake the can well, so they both mix together. If someone has an allergy to pistachios, what’s another nut alternative you’d suggest. Cashews would be a good alternative that will go well with the flavor profile or even almonds. 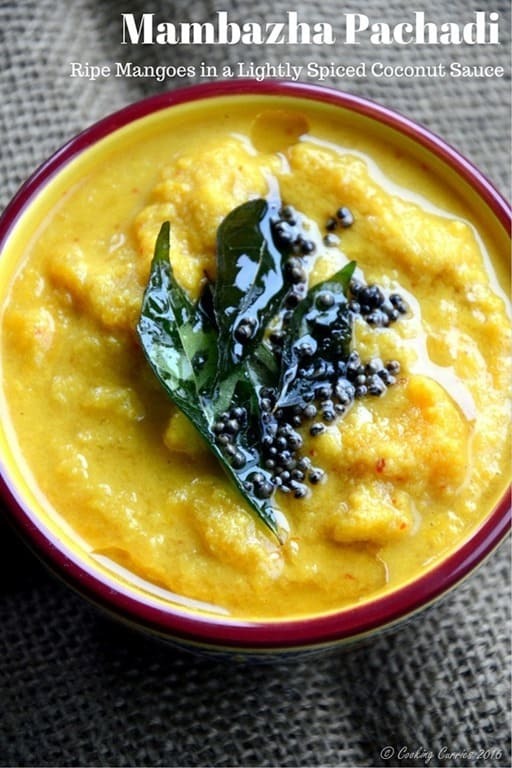 You can totally skip the nuts and add some saffron instead for some extra flavor.